Opinion: On Christmas, I Helped 2 Brothers In Zimbabwe. Why Did I Feel Sad? : Goats and Soda I had gone home to rural Zimbabwe for the holiday. In the village shop, two skinny young boys came in to buy cooking oil and bread. They hoped to use any leftover change to buy treats. 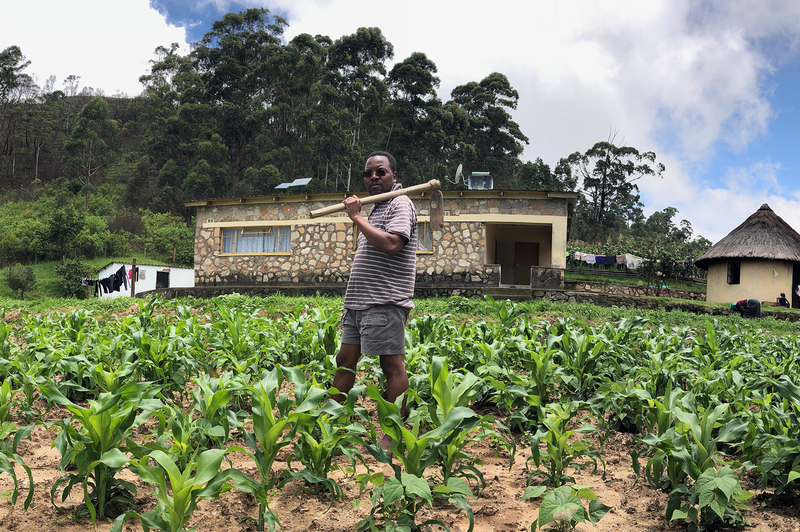 Ed Mabaya on his parents' farm in Zimbabwe. Gladys Mabaya (left) and her husband used income from their small farm to educate their 10 children. 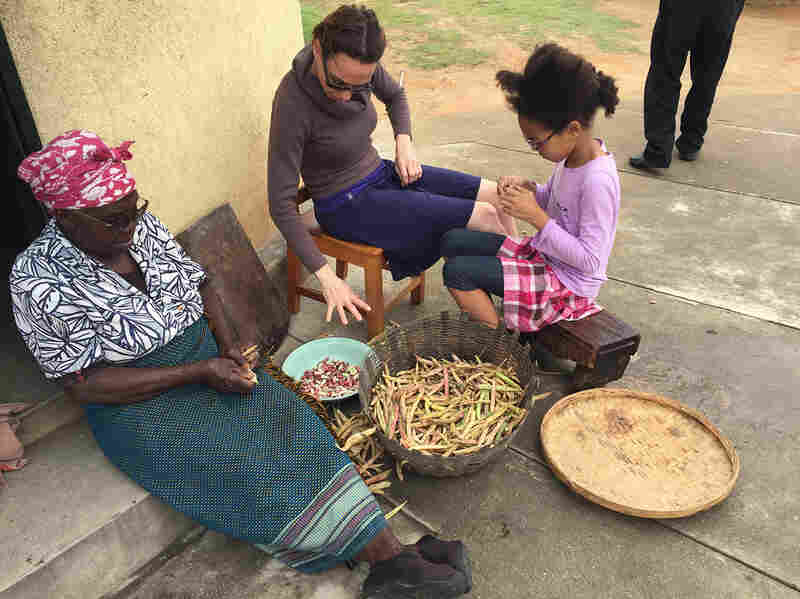 The author's wife, Krisztina Tihanyi, and their daughter, Izabella, help prepare beans for a meal during a Christmas visit to Zimbabwe. Last year, my wife, daughter, and I traveled from the U.S. to my childhood village in Zimbabwe for the holidays. As far as nostalgia goes, nothing for me beats holidays at my childhood rural home. The entire village feels very much like one happy family reunion as folks from nearby cities, neighboring countries and overseas converge in their childhood homes to celebrate the festive season. I am especially proud to share this tradition with my Hungarian wife and my American-raised daughter. On Christmas Day, with a dreamy head, I woke up to the familiar sound of my mother calling my name and knocking on my door, which instantly transported me back to my childhood. As is morning tradition on Christmas Day, everyone was preparing for the church service before brunch. I quickly freshened up and put on the most decent clothes that I had packed. Along with my parents, one sister, two brothers and several nephews and nieces also visiting for the holidays, we strolled a little more than a mile to the village church. Along the way, we passed the tiny village store that also doubles as the bar over the holidays. My brother wisely advised me to stop and prepay for drinks as stocks were likely to run out due to high demand from the holidays. When I stepped into that tiny familiar store that still smells of kerosene, it looked as if it were frozen in time. The shelves were stocked with the same village basics – cooking oil, salt, soap, candy, school uniforms, stationery, matches, candles and Madras curry powder. I could not help noticing that many products that used to be locally made were now "made in China" brands. As I was placing my drink orders, two young boys about 5 and 8 years old walked in with big smiles. Their clothes were oversized, old and tattered. I've spent years working on food issues as an economist. To me, they looked malnourished. The older brother emptied his pockets, and, placing a handful of coins on the counter, cheerfully declared they had been sent to buy food for Christmas. He asked for "two loaves of bread, cooking oil, condensed milk and, and ... " Before he could finish, the younger brother interjected, "My mother said we could buy candy from the change." "And five of the yellow ones, too, my sister likes them." "That is more than plenty for the change," the shopkeeper interrupted. "It's OK, they can have whatever they want," I interjected with a smile. "It's Christmas Day today, and you can add it to my order." The two boys clapped hands, a traditional way of saying thank you. I told them to get whatever they wanted. The younger boy declared they would have five of every candy available. "For mum, dad, my sister, my brother and me," the young brother said, barely able to contain his excitement. "Can we add two more loaves and one bottle of cooking oil? And rice, too?" the older brother politely asked me. I nodded, and the two brothers started dancing with joy. All in all, their order cost me less than $5. But I could tell from their grinning faces that I might as well have been Santa. I asked the boys where they were from and it turned out they were our neighbors. In fact, their father had been the classmate of one of my brothers when he was in primary school two decades ago. The church bell rang, and I rushed over to join my family. As we stood outside the little church, I was suddenly overcome with emotions. These two boys were stuck in a vicious cycle of rural poverty. The main reason they were poor is because their parents and grandparents were poor before them. And I reflected on my good fortune. As small farmers, my parents had gone beyond producing just enough to feed the family to making the most from their land. They had well-terraced fields and used a combination of manure and chemical fertilizers. They planted only certified seeds of improved varieties and followed the advice of agricultural extension officers. Not only could my mother and father keep their family well-nourished, they could sell their surplus crops to nearby city markets and invest the money in the education of their 10 children. The two boys in the shop made me think. They looked OK. But the idea of a holiday meal of bread and rice, not the most nutritious of combos, made me wonder what they eat throughout the year. And I know that in many parts of the world, even bread and rice would be a feast for malnourished and starving children. And in 2018, reports of childhood hunger in places like Yemen and South Sudan made headlines. In 2017, about 795 million people in the world did not have enough food to lead a healthy active life, according to the World Food Programme. Ten percent of the world's population lives on less than $1.90 a day, and 22 percent of all children under 5 years were stunted in 2017 – their physical and cognitive growth slowed from a lack of nutrition. These statistics that I usually glance through in the numerous development reports suddenly had a face that demanded an urgent answer. I felt my eyes well up with tears. It took so little for me to give these boys and their family a memorable Christmas. And there are millions around the world who donate to worthy causes, especially during this season of giving. Yet all this generosity does not add up to solve the systemic problems behind poverty. As a development economist, I know that it takes coordinated efforts by governments, the private sector, development institutions and philanthropic and civic organizations. The church bell rang for the third time signaling the start of service. As I shared in the joys of Christmas with the more than three dozen people at the service, singing carols like "Joy to the World" and "Silent Night," I couldn't help but be haunted by hard questions: In a world where we struggle with obesity and food waste, how can there be hungry people? And what else can we do — as individuals and global citizens — to secure a future free of hunger and extreme poverty for all? Edward Mabaya is a scholar and a development practitioner with more than two decades of experience working on agricultural development and food security in Africa. He is a 2016 Aspen Institute New Voices Fellow. Follow him on Twitter at @edmabaya.